Our "Museum Town" once was a bustling place, and people had a little extra money to eat out once in a while. Here are some of the eating establishments in town, in roughly alphabetical order. Photo 1276. Unidentified but charming cafe/restaurant, undated. Kim Vrtiska: Very narrow building, I count about 12 seats only. Everything on menu looks to be 25 cents. Dan Rowlison Is that a stove pipe running horizontally across the ceiling? They did used to heat buildings that way, but ceased the practice when buildings began to burn. Jennifer Hunt Fascinating, Dan. I just thought it was to use an existing chimney. Pretty clever - and dangerous, I guess. Dan Rowlison It does give access to an existing chimney, but that pipe puts out HUGE amounts of heat. 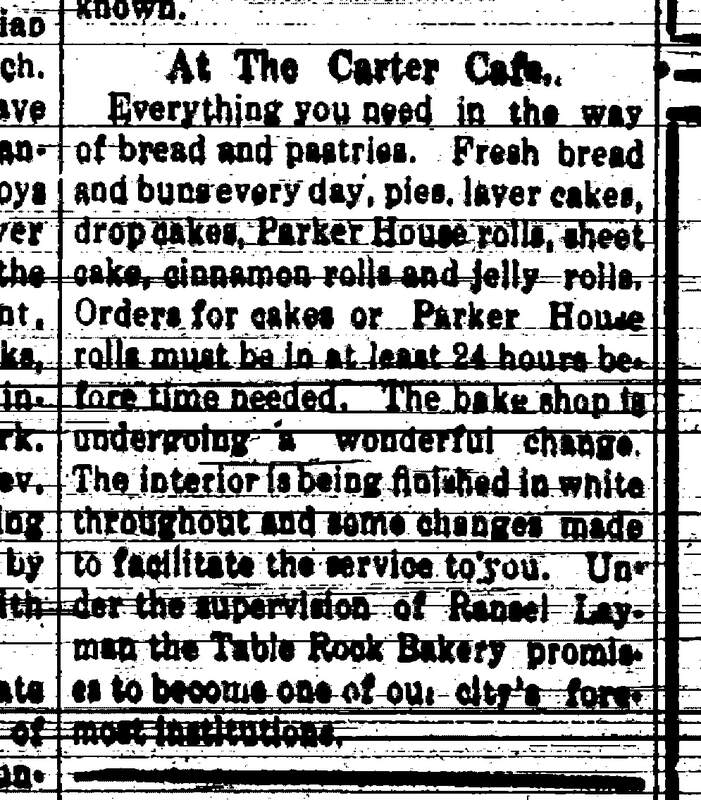 1918 advertisement for the Carter Cafe., with fresh bread and buns every day, pies, layer cakes, and more. It sounds like the kind of place shown by the picture above, but we don't know where it was. 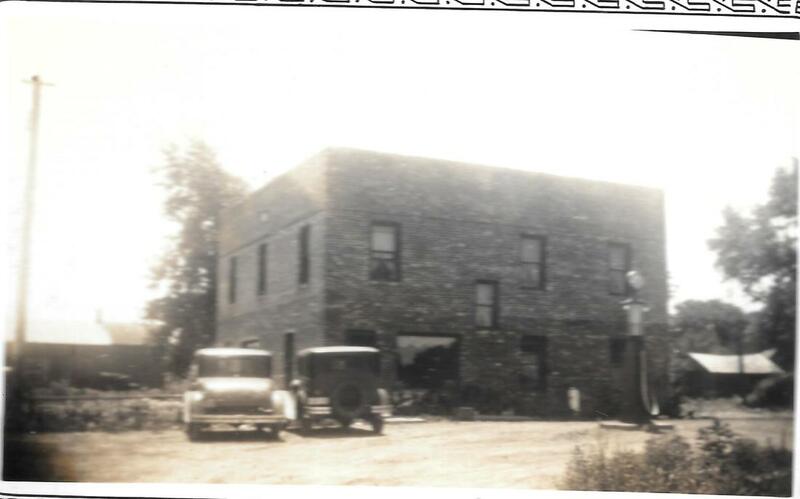 In Photo 194 can be seen a modest eating establishment with billiard tables in the back. Joe Sochor confidently identifies the location as his building, which is on the East side of the Argus Museum. The configuration of windows and doors is exactly this. 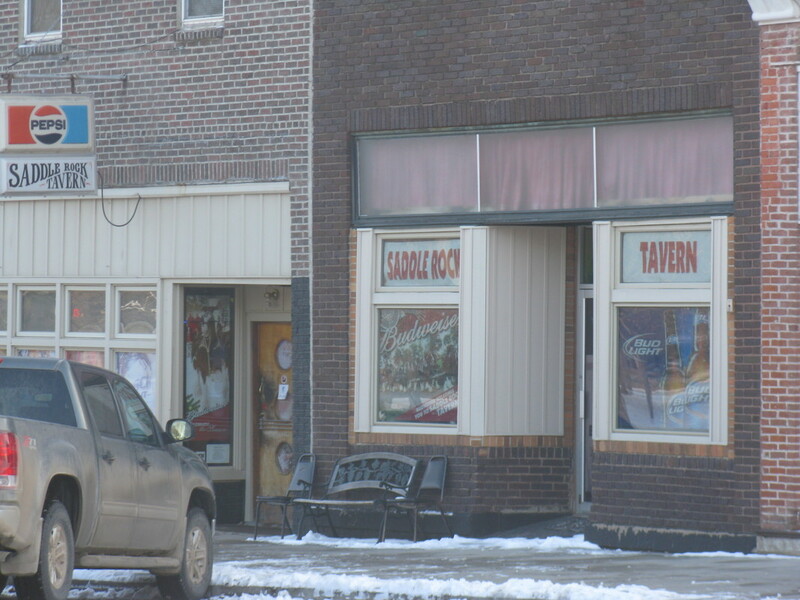 He says that the bar on the left was moved two doors down to what was most recently known as the Saddle Rock Tavern. The man are Lewis Day, John Cockrill, A N Aylor, Sr, George Griffing, then in front of the stove is J B Carter, and behind the stove is Frank Goodenkauf, Sr. Note that J. B. Carter was an amputee. 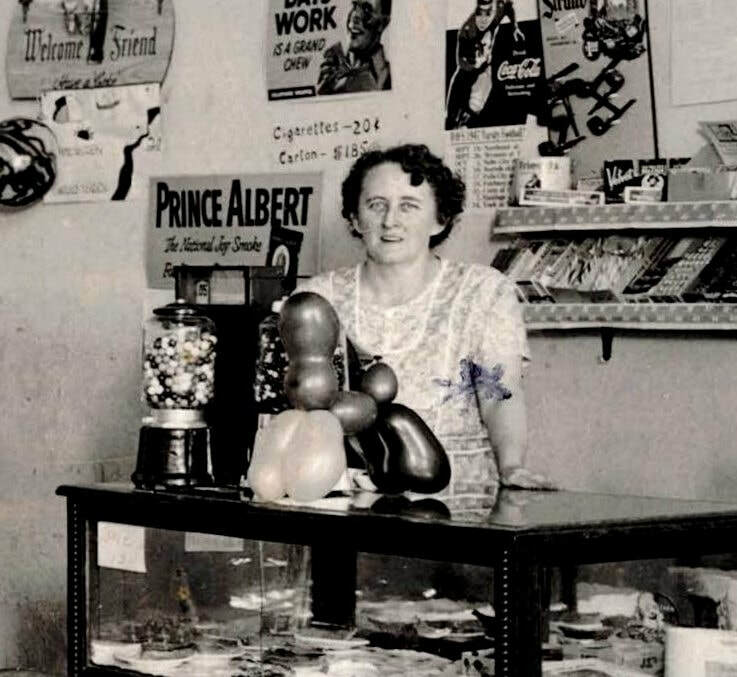 The calendar on the wall in the back is dated 1921, and the movie advertised on the flyer to the right (the Rosary) was from about that time as well. 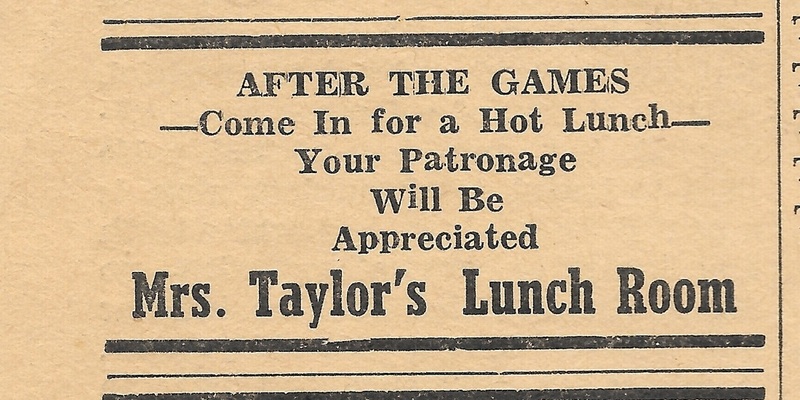 Note that there was a Carter establishment in 1918 and another was advertised in 1922. J. B. Carter may be a worker but he also may be the proprietor of this place. 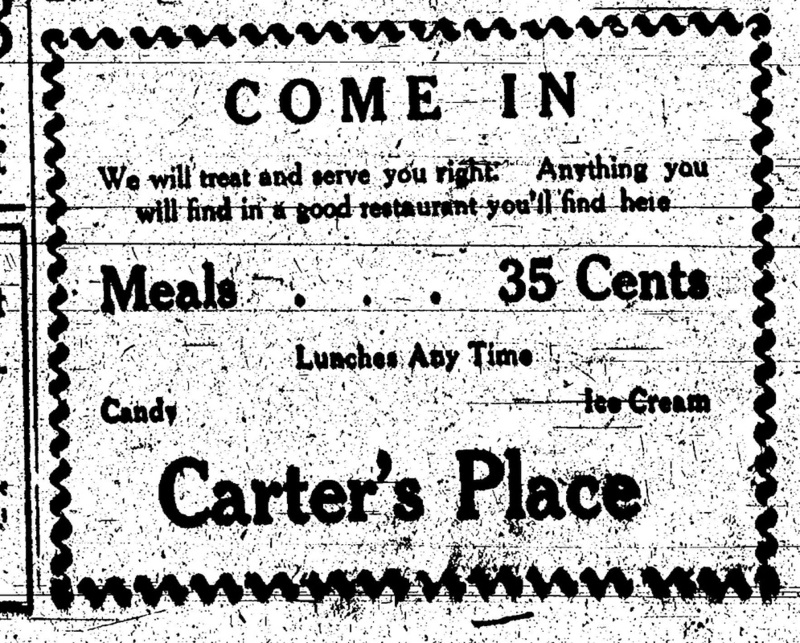 This is perhaps one of the two advertised Carter establishments. J. 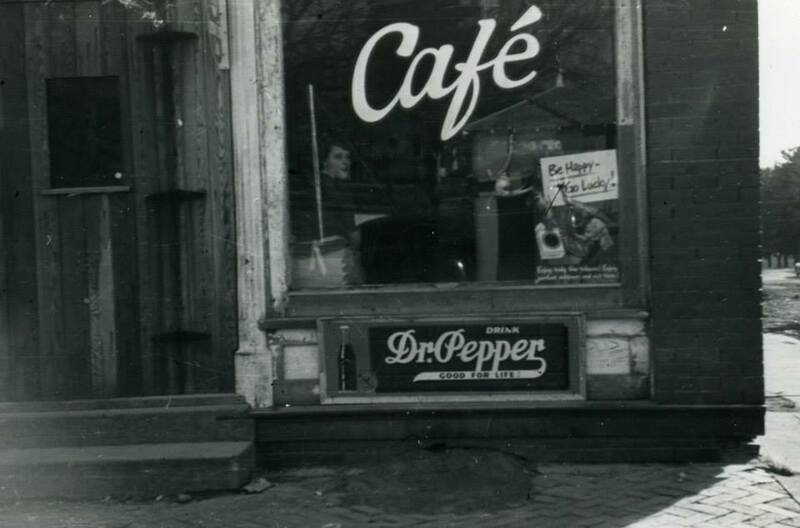 B. Carter may also have had a cafe (lunch counter) by the depot at one time. 1893 - the City Restaurant. The only place you can get a lunch at all hours. Oysters and a full line of confectionaries, tobacco products --- and "temperance drinks"! City Hotel & Restaurant, 1900. Proprietor R. P. Jennings. The Depot Lunch Counter was at the train depot. In 1896, the town Marshal, Nicholas Craig, was murdered by a tramp who had come in on the train from Falls City. The tramp was wanted for burglary in Falls City and Craig and his deputy had gone to the depot to investigate. The "lunch counter" may actually have referred to an eating establishment in the hotel across the road. 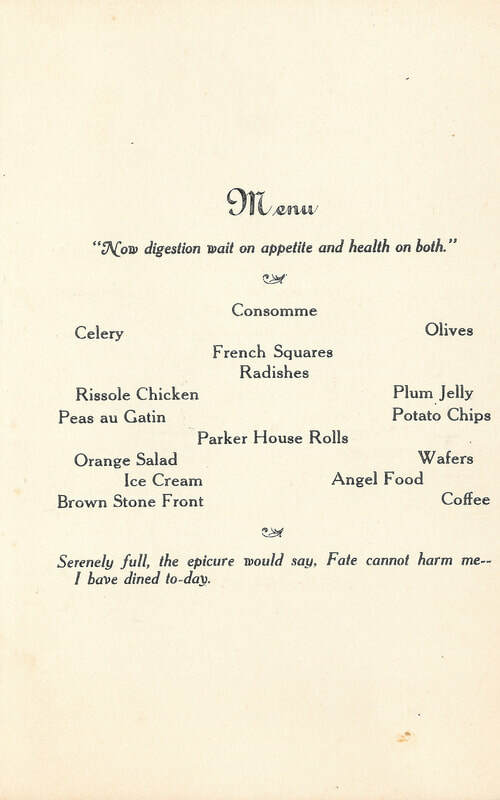 The Lincoln Hotel was new in 1918, and this menu is probably from that time or not long thereafter. It was built as the Lincoln Hotel, but Hotel Lincoln -- like the Hotel Murphy down by the depot -- certainly does sound better. 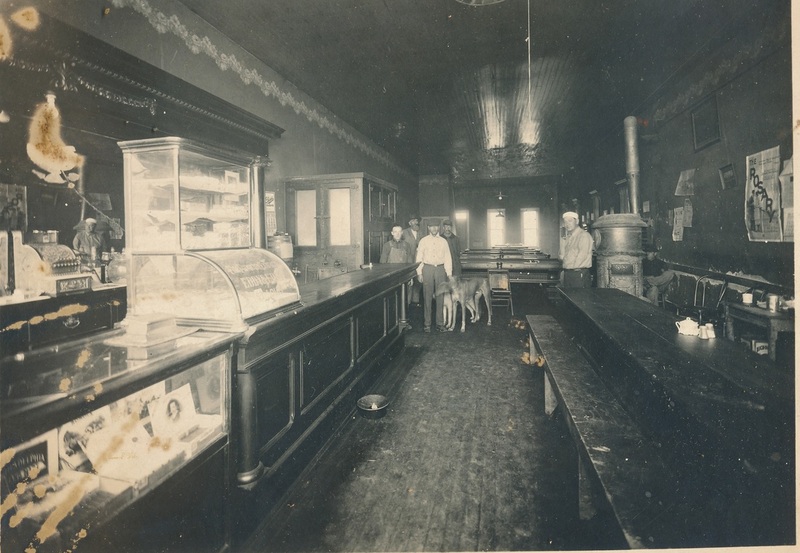 R. P Jennings Restaurant, 1916. The proprietor was "Captain R. P. Jennings," a confederate soldier who left the South's dismal economic picture to become a pioneer in Pawnee County. He was an entrepreneur with his finger in many businesses. J. H. Lehman Restaurant & Confectionary. December 2, 1882. Lehman was a Union civil war veteran. He belonged to the Grand Army of the Republic. When he died in 1941, he had been the oldest living Civil War veteran in the county. Excerpt of Photo 558, John Lehman in an 1887 group photo of Civil War veterans. Johnny Clark had a cafe in the Argus building. 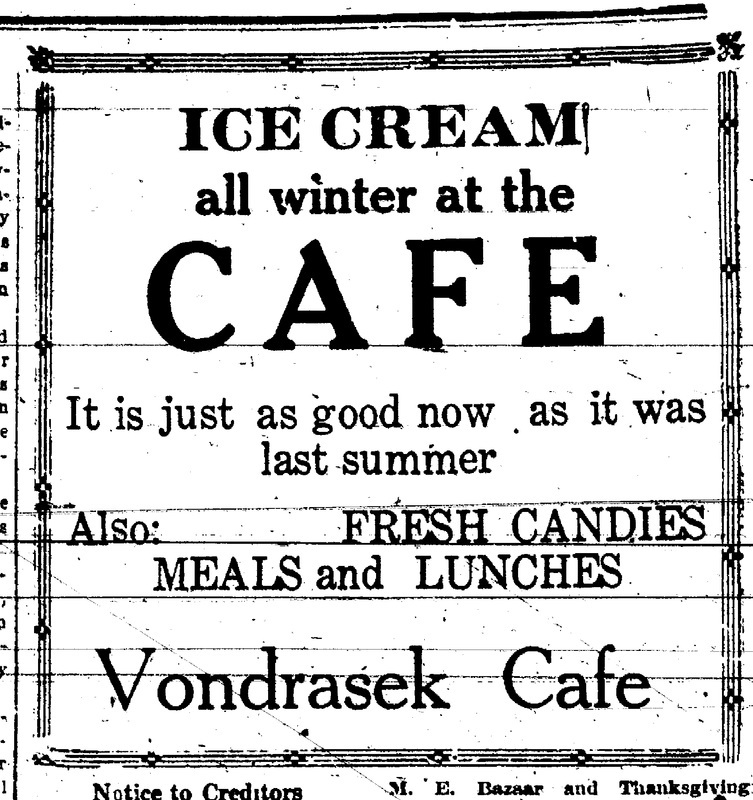 The grand opening was in 1947, to which Gladys Vondrasek can attest. She met Bob there at the grand opening. Photo 1502, from the Historical Society's collection. Note the wooden entry door. The Reno Inn from Ronnie Gilbert, whose parents had the Reno in the 1950s. Photo 3660. 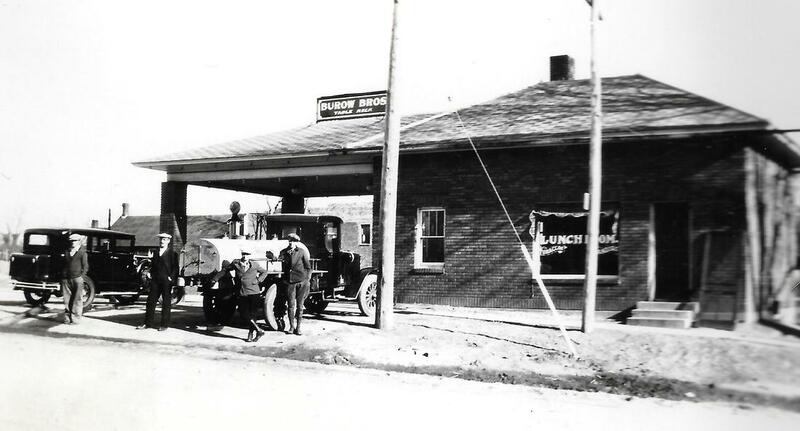 Lou Fencl took this picture when he worked at Burow Brothers in the late 1920s-early 1030s. Photo 3345. 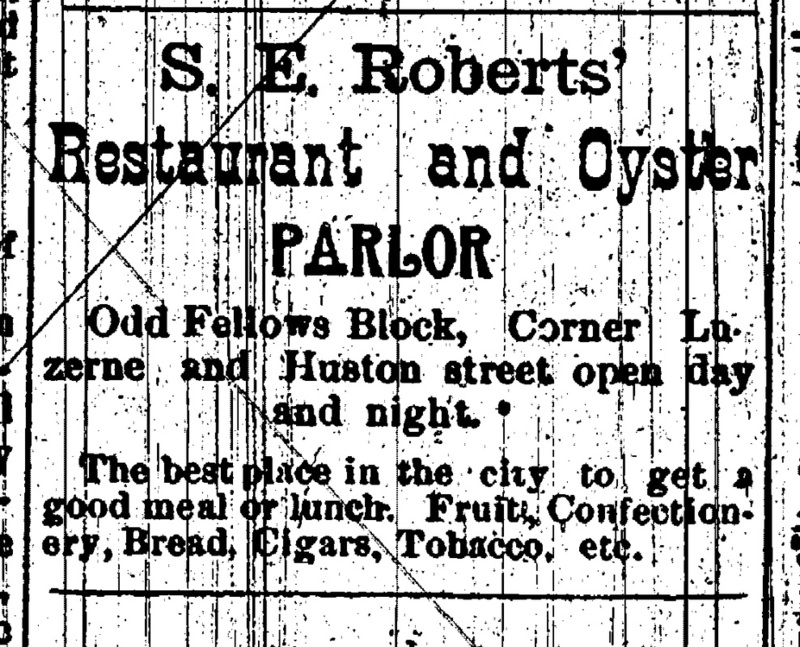 Roberts: 1898 - S. E. Roberts' Restaurant and Oyster Parlor. 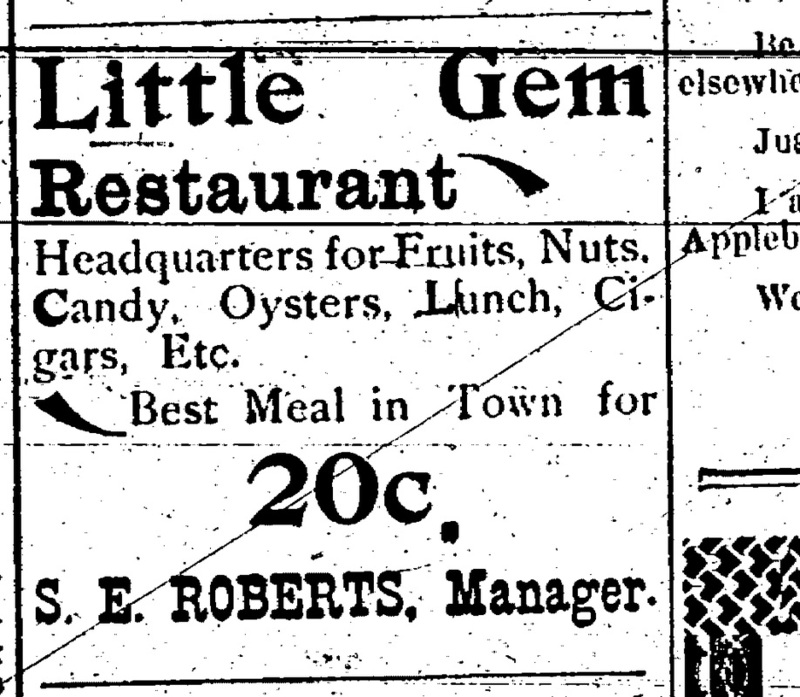 By 1900, Roberts was running the Little Gem Restaurant. 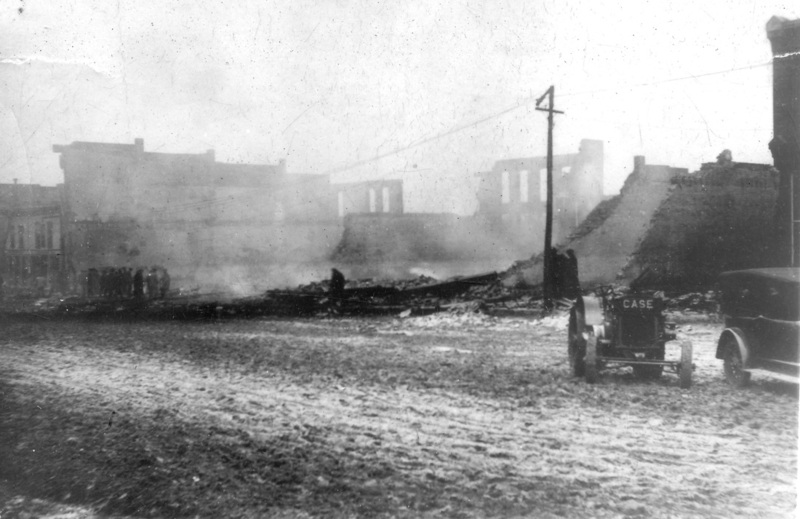 February 20, 1920 -- a week after the big fire on the southside that burned many buildings, including Sherman's Restaurant, has moved to the Marble Building (west side of the Odd Fellows building). 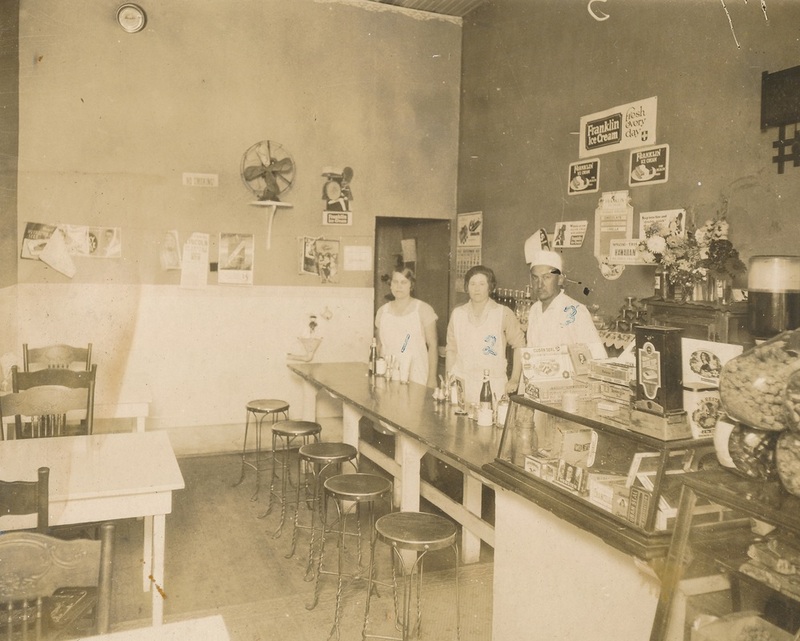 This is the only apparent restaurant on the south side that appears in this pre-1920 photograph, but is not necessarily Sherman's but may well be. Photo 125. 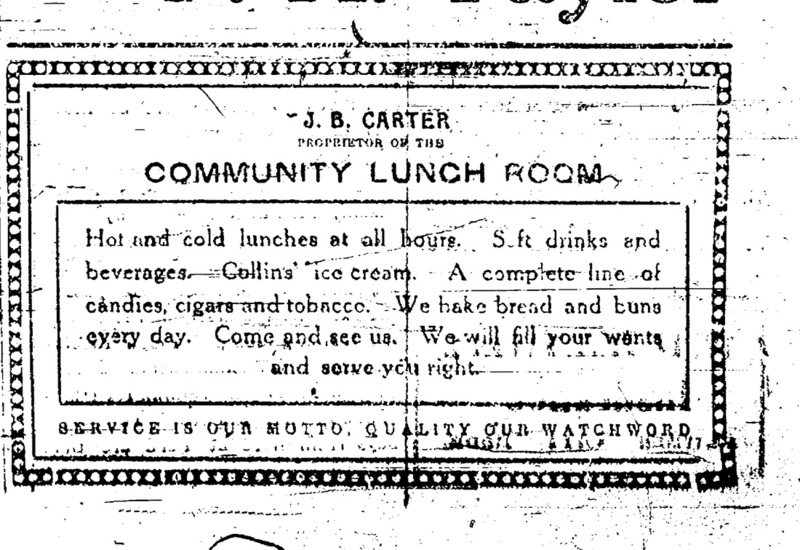 The morning of February 6, 1920, the same south side businesses. restaurant at the marble hotel? There may have been a restaurant at the Marble Hotel (next to the Odd Fellows building), as suggested by this 1908 menu for am alumni banquet. 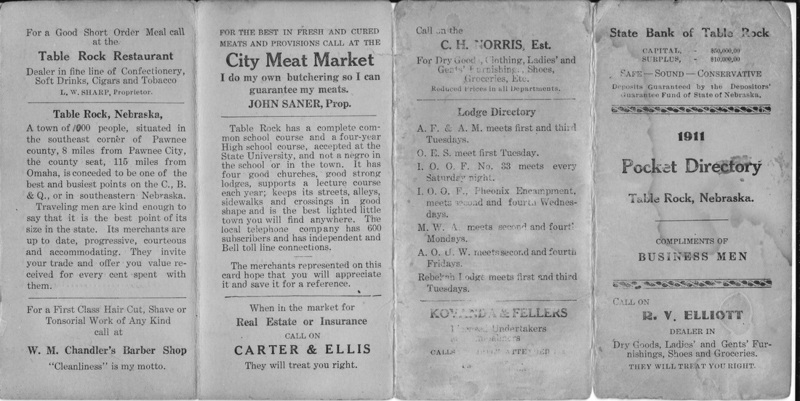 A 1911 Pocket Directory of businesses includes an ad for the Table Rock Restaurant, proprietor L. W. Sharp, where a "good short order meal" could be had, as well as confectionaries, soft drinks, and tobacco products. Long gone, this popular place opened in the late 1960s and existed until? The late 1970s? 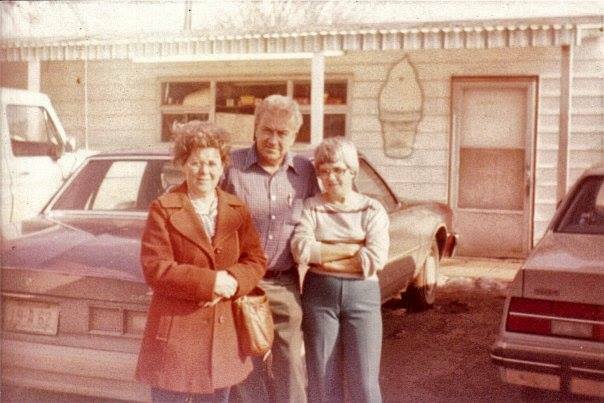 This photo, Photo 3001, was taken in front of the drive in and was shared by Sput Turnbull. In the picture are Leota Trimmer Uhri with Bert & Reah Trimmer. "The" hotel in this case was originally known as the Lincoln Hotel, and was the home of many cafes, often just referred to as the hotel cafe. 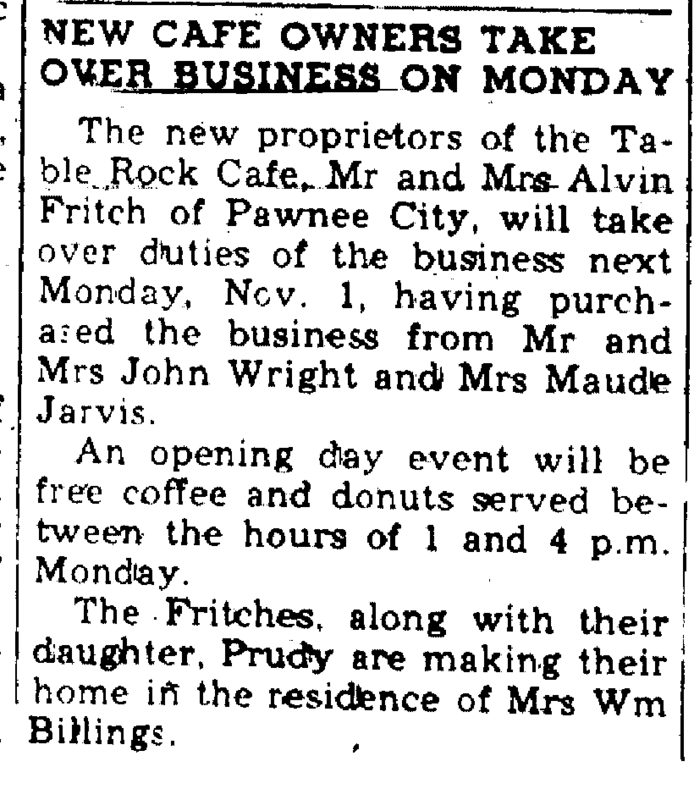 Beginning in 1951, the cafe (and hotel) was owned by the Howells. 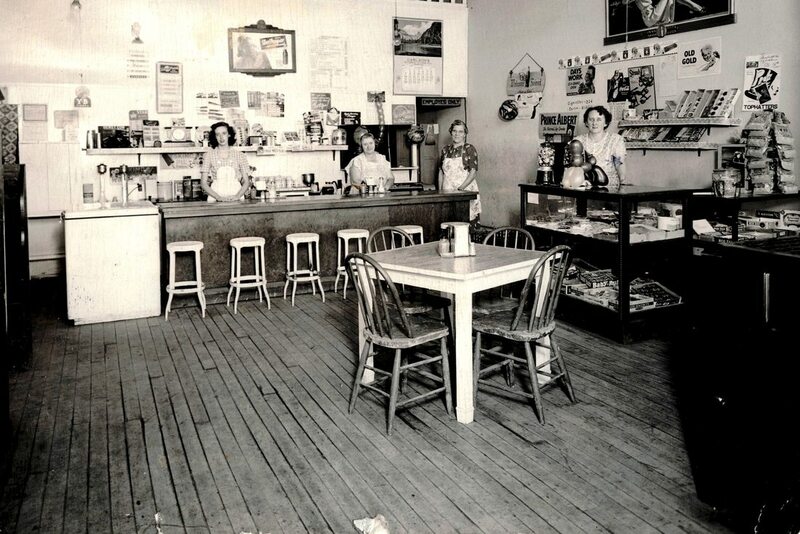 This photograph of the Table Rock Cafe (Photo 1748) is probably of the Howell era based on the apparent age of the woman at the far right, who is Cecile Bowen, whose grandson Brad Bowen donated this picture. Cecile was born in 1902. In 1951 she would have been 49. Does she look 49? Might be. If so, then this picture is from the Howell era. The other women aren't identified or we'd use the age as a guide, too. There are at least two calendars on the wall, but with enlargement they are just too fuzzy to read. Cecile (pronounced Cecil by her family) Bowen. There are balloons in front of her -- a grand opening? The other ladies in the picture. Is the photograph above from the Howells tenure at the hotel, or under previous ownership? 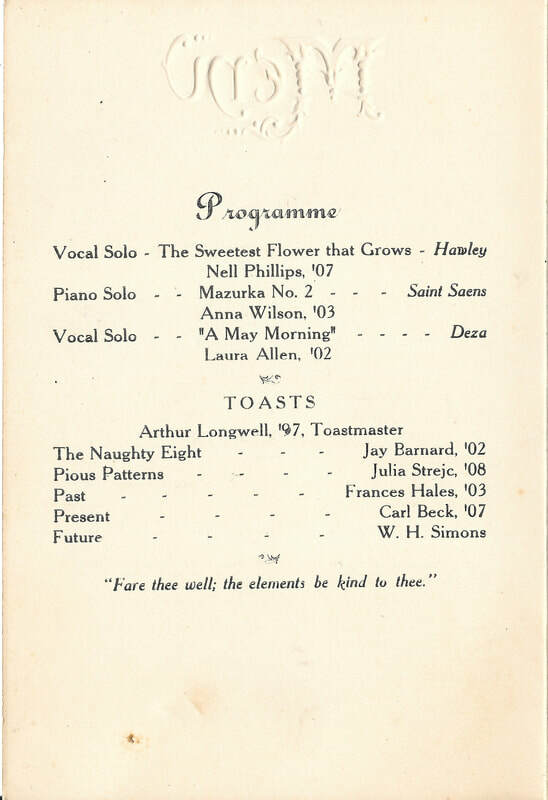 In any event, the Howells took over in 1951. They had the cafe in at least 1952, as the Howells daughter Ardyce Freeman remembered that the painter who did the murals at St. John's Catholic Church stayed with the family during the project, and then when he finished he went to the Howells to take them to see what he had done. Ardyce remembered, "And we grabbed Lena, the cook at the cafe" to go with them, as she was Catholic, too. The Gerits ran the cafe in the 1970s, as Suzanne Sitzman Ellis and Jerry Vrtiska recall. October 28, 1954. Where was this? Was this the hotel cafe? 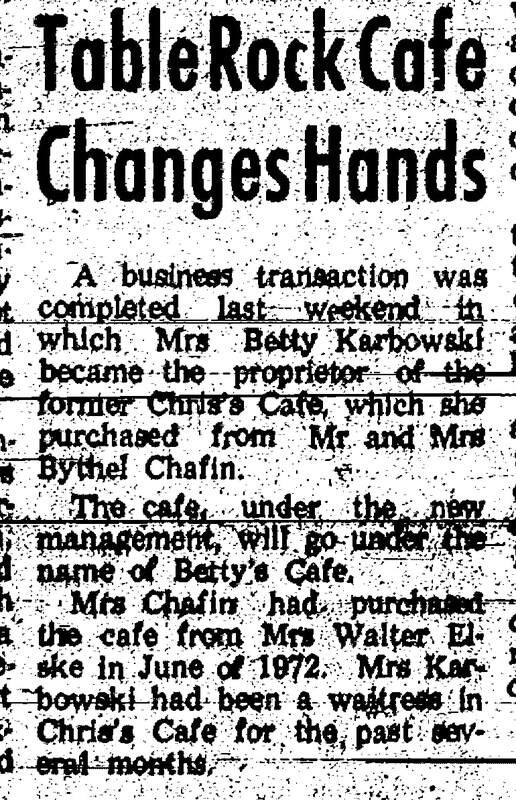 Three changes of owners for this cafe were documented in this 1973 article. Betty's Cafe, proprietor Betty Karbowski. 1973. 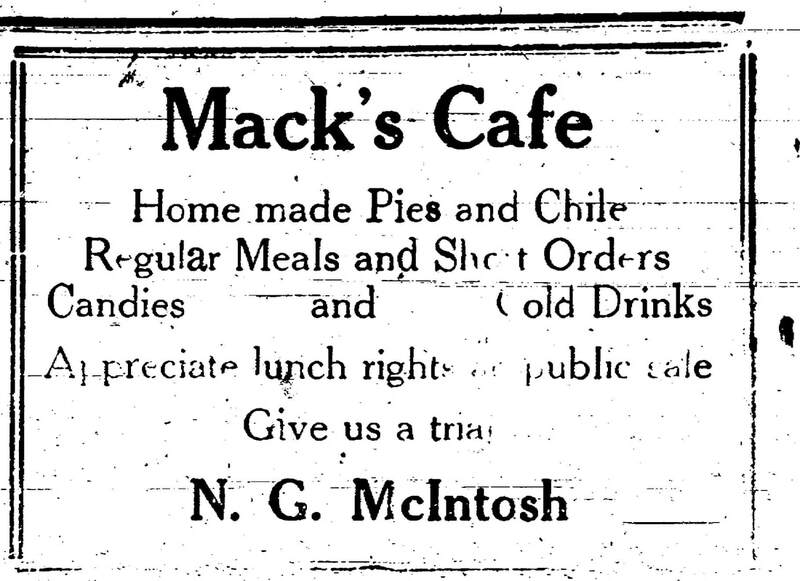 From a 1934 edition of the Lincoln Star: The Two Way Inn. It was later re-named the Reno Inn. Bill Vondrasek later became postmaster of Table Rock, and held the job for many years. 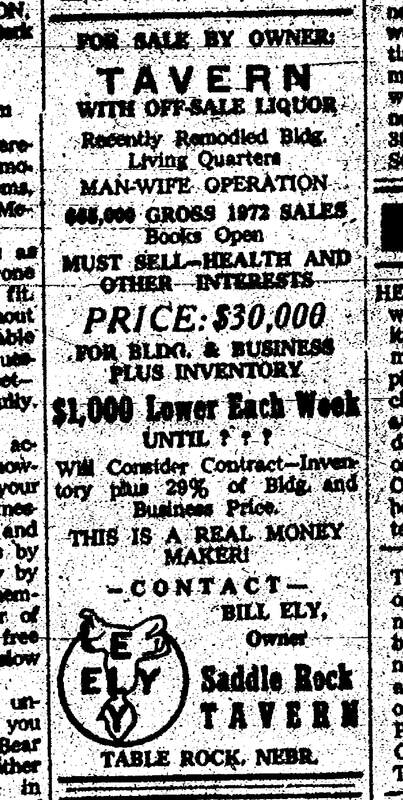 From the March 22, 1935 Argus. Where was it? Dunno. 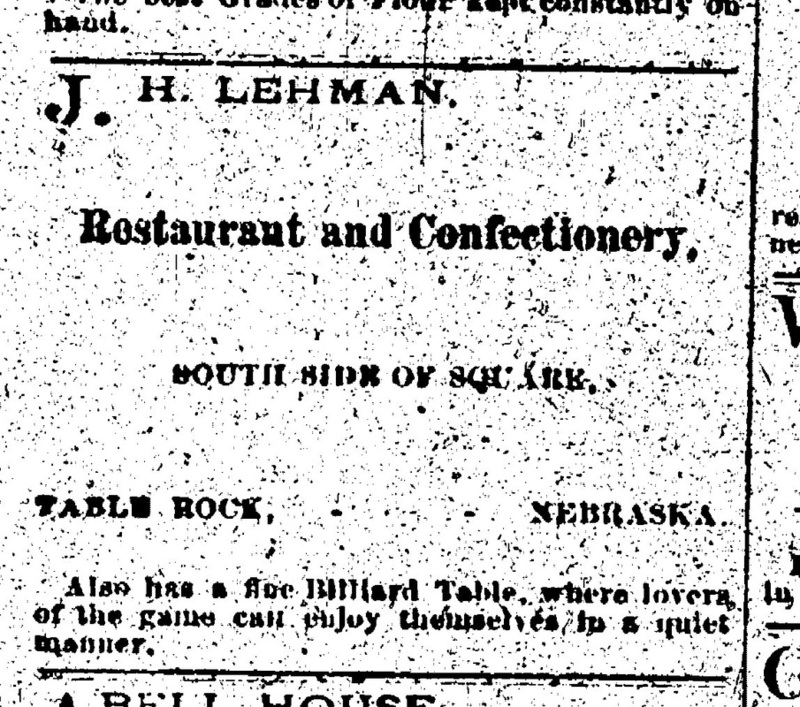 a restaurant in 1882 -- on the east side of the square? Mary Duder penned a history of St. John's in which she collected the memories of the older parishioners. Her history was written some time between 1953 and 1962. It includes this unique memory of a restaurant in 1882. It is not confirmed, but the Frank Sochor residence is believed to have been on the west side of the Square. That would have been just a block away for the church boys. Speculate with us. Look at Photo 5 below. It is in the Historical Society collection but unidentified. Is it in Table Rock? There is no one alive who remembers, but that does not mean it was not here at a prior time. 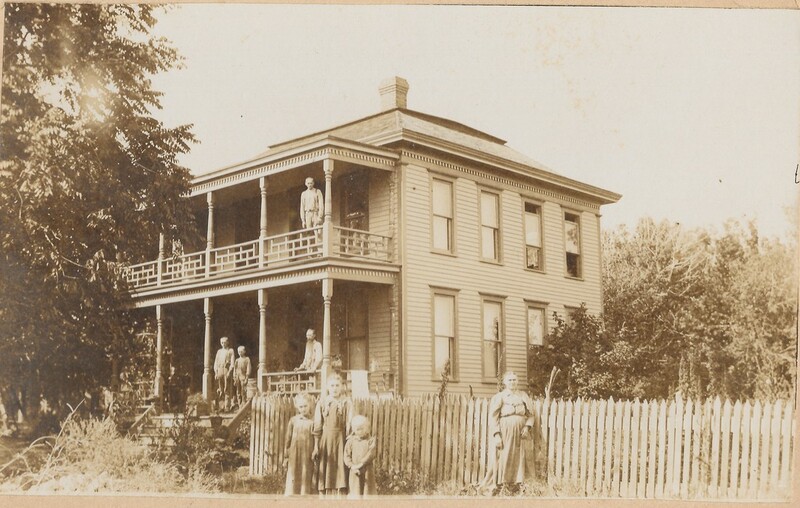 It appears to be a hotel or a boarding house as the people posing do not appear to be family members. Is this the building that housed a restaurant in 1882? Is the slope right for a location on the west side of the Square? The ground seems higher on the left and to slop as it goes to the right, as judged by the fence. Note that Joe Sochor recalls there was a hotel when the first Sochors arrived from Bohemia, as the family story is that they stayed at a hotel or boarding house on he west side of the Square. Joe did not know if this was it. Most of the oldest people in Table Rock now were born in 1926 or after. 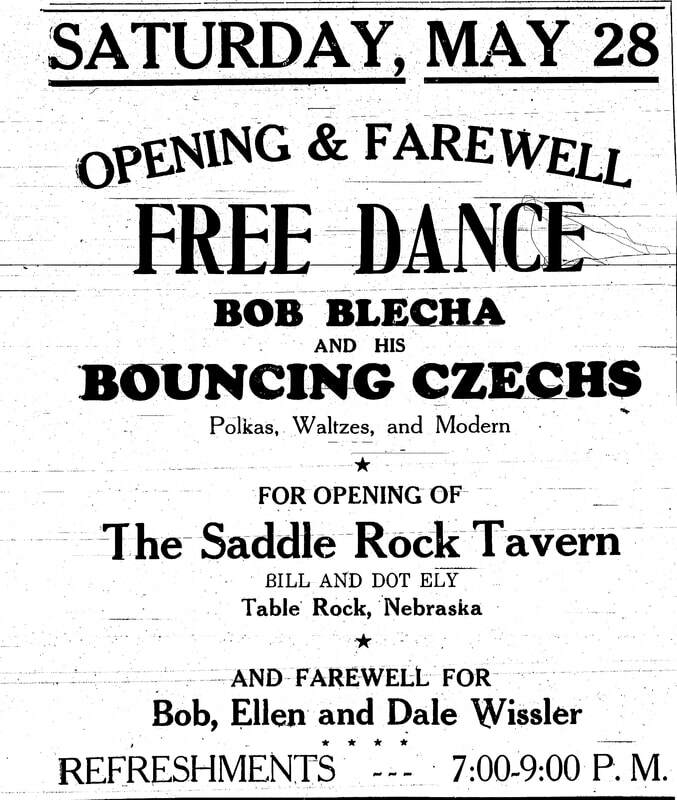 The Saddle Rock was a bar and grill. The previous businesses in the same space, run at various times by the Fishers and by Carl Westphal and others may have been, too. The Saddle Rock had a lot of music going on, too. In February 2018, Judy Griebling opened up her new Round Up Bar & Grill in the old Saddle Rock space. Here she is, in the middle, with siblings Harry Griebling and Ethelann Stillinger, in a photo taken by Amy Hunzeker. Notice the bar from the picture of J. B. Carter's billiard hall and cafe above? Joe Sochor said that it was originally in his building (the second west of the Saddle Rock's main door) but moved to its present location at some time after the photo was taken. The back bar took another journey, too, when Dave & Tina Mains closed the Saddle Rock and sold off the interior furnishings, but was brought back and lovingly restored by Judy's family. Judy with the help of family and occasional voluntees essentially gutted the place then re-built it to its present state. As of April 2012, the Round Up is open at 4 p.m. every day of the week but Tuesday. Judy hopes to be open for lunch soon. The Senior Center's cafe opened in the early 1990s, but has become a significant eating establishment under the skills of Sput Turnbull, cook and manager. It is located in the old hotel building at Luzerne & Nebraska, southeast corner of the Square. Pretty well all the food is homemade, from bread to desserts. The biggest days are Wednesdays, which is fried chicken day. Thursdays are for homemade kolaches. Seniors eat for $4, including beverage and dessert, and others for $6. Reservations are required, by 9 a.m. on the day of the meal, call 402 839 2060. Meals are served at Noon. 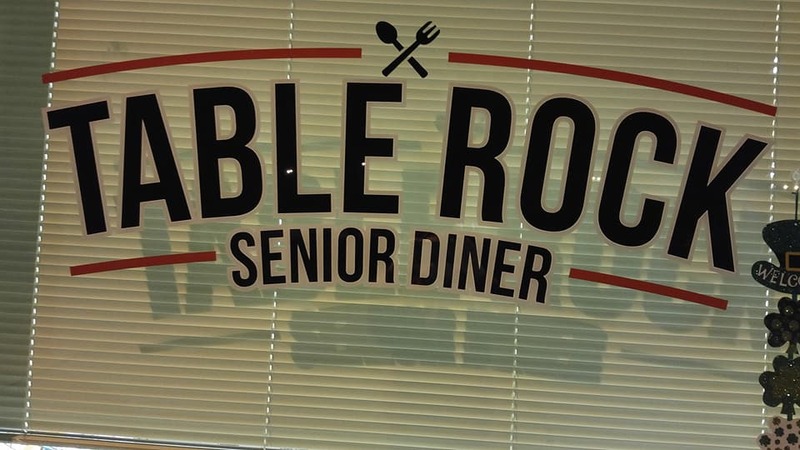 Senior Diner front window, photo shared by Sput Turnbull. Rhonda Gilbert installed the sign. A "lunch counter" in table rock? This professionally-made photograph comes from Richard Binder, whose father Howard grew up in Table Rock, as did his grandfather Wes Binder, and so on. Where is it? The picture doesn't say. Older residents who have looked at it don't recognize it. The lay out does not look familiar to them, nor the light fixtures. 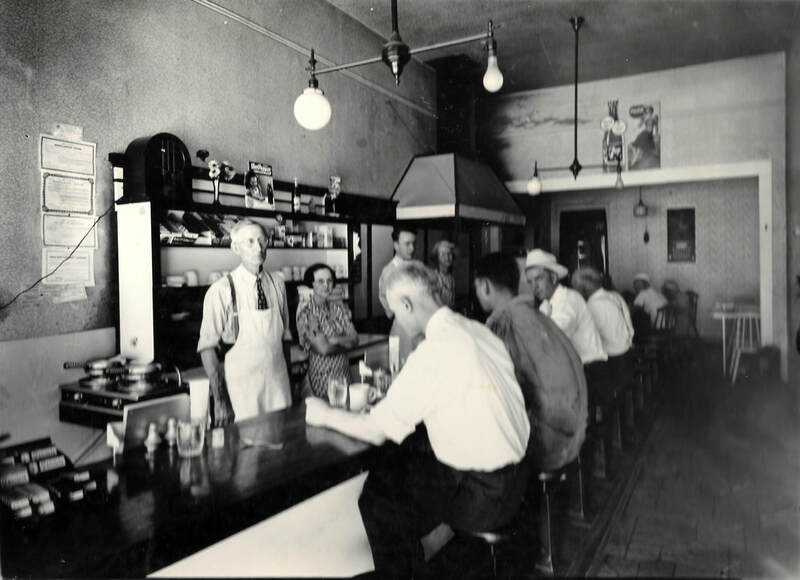 However, if this was taken prior to the mid-1930s, most of those older people would have been young children, might have been farm kids who didn't get a chance to go to places like a cafe. 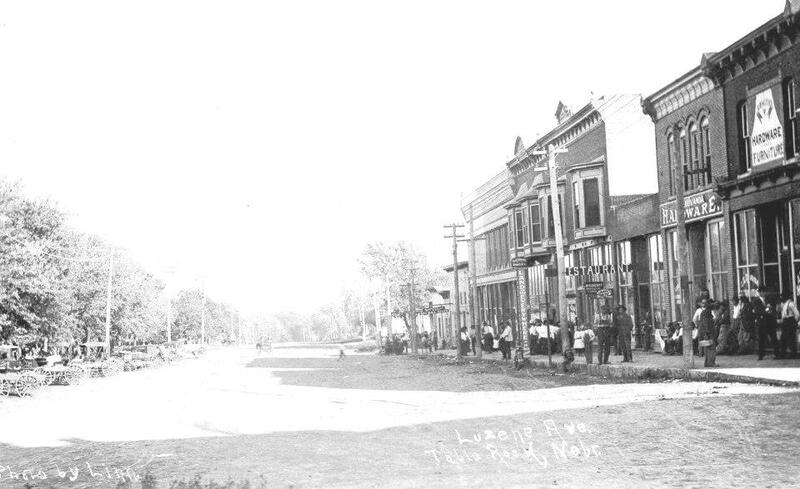 The hotel at Luzerne & Nebraska had a restaurant since it was built in 1918. It may have been remodeled more than once. In addition, there are many hotels on the page above that no one alive has ever seen, or have not seen since very young children, in buildings that have had other usages over time. The age of the picture might be guessed at based on the 7-up sign in the back. Is that girl dressed in the style of the 1940s? There is no way of knowing at this time where this restaurant was. One might speculate that it doesn't make sense that a Table Rock family would have a professional 8 x 10 of a restaurant from somewhere else, but there are always explanations of why that might be. Does anyone recognize it? Photo 1735, shared by Richard Binder.